During the Warring States Period, there was a musician named Gongmingyi, who played musical instruments very well. Many people liked listen to him play, and respected him very much. One day, Gongmingyi saw a cow when he was having fun in the countryside. He thought, "Everybody compliments my music. Why don't I play for this cow?" So he took out his guqin, He played a piece of elegant quaint music for the cow, but the cow just kept grazing the grass with its head down. 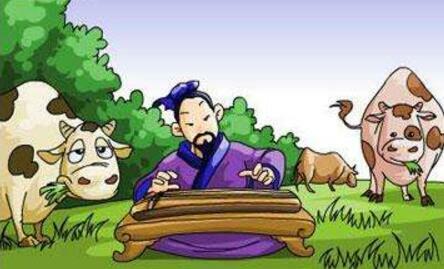 He thought that the cow might not listen to the elegant quaint music. He played another piece of joyful music, but the cow still kept its head down to graze the grass and totally ignored him. Gongmingyi was so disappointed and started to question his ability. Someone passing by saw this scene and said, "It's not because your ability is bad. It is that the cow cannot understand music at all." Gongmingyi sighed and had to go home with the guqin.